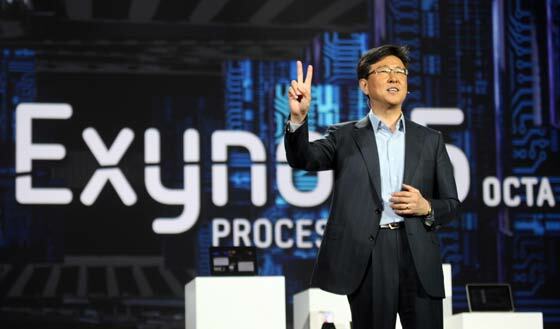 Samsung talked about the Exynos 5 Octa, a new eight core processor, at a keynote presentation at the CES last night. However the firm wasn’t just talk, it had built a reference tablet device to demonstrate the possibilities of the new processor to the audience. Stephen Woo, president of Samsung Electronics' components business, described the new Exynos 5 Octa as “An architecture that gives you all the power you want to run intense applications but is smart enough to conserve energy when you are running more basic tasks.” The new processor is said to offer something we often hear about recently; a “high performance, low power” computing nirvana. Looking at a bit of technical info for the Exynos 5 Octa; the processor is based upon the ARM Big.LITTLE technology where the big cores are a Cortex-A15 design and the LITTLE cores are a lower power Cortex-A7 design. Specifically the Exynos 5 Octa features four Cortex-A15 cores and four Cortex-A7 cores. The Exynos 5 Octa will be a 28nm part. Also in the above video Samsung shows off its flexible OLED displays (from about 40 minutes onwards) and surprisingly Bill Clinton pops up at the end of the video with a message about “Samsung Hope for Children”. It isn’t mentioned when the Samsung Exynos 5 Octa will be made available but it will probably be facing fierce competition from other new improved mobile processors such as the NVIDIA Tegra 4 and Qualcomm 800 Series when it does appear. Got to say that my Note 10.1 is rapid enough for me as it is with a “mere” quad core.